Spammers are at it again. This time, one by the name of Tool Box Studio. Tool Box Studio has 137 apps according to App Annie, and is linked to another developer account harboring another 28 apps, implicated by the name "Fotoable" in the Google Play URL app ID. 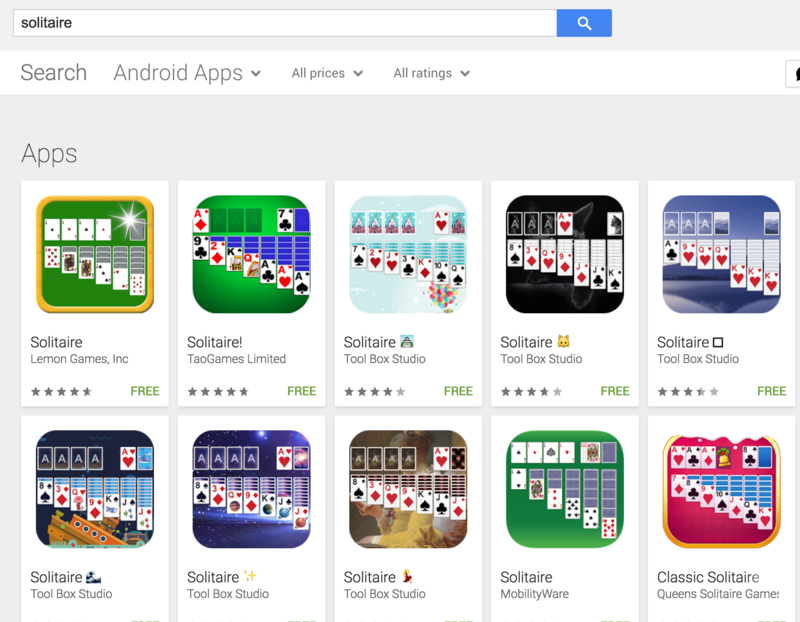 In addition to spamming their way to the top of "weather," Tool Box Studio/Fotoable has also spammed searches for "solitaire." Diving deeper into the keyword, "weather," we can see that this spammer managed to beat out a good many stalwart, highly relevant weather apps, including the Weather Channel, Accuweather and Go Weather, each of which has 50 million to 100 million installs and ratings of 4.3 or higher. The spammer's top app, Weather🌠 (AKA weather fantasy, per the app's ID) has only 1,000 and 5,000 installs. So how did this spammer manage this neat trick? 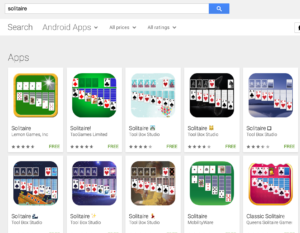 The reason Tool Box Studio/Fotoable was able to send eight of its apps into the top 10 rank for searches for "weather" is probably mainly due to its use of ultra-cheap "burst" installs, or installs acquired from bots, device farms or people in other countries hacking their store settings to appear as though they are US Play Store users. 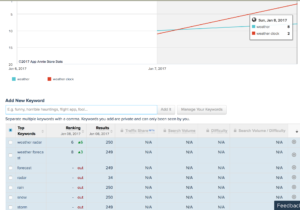 This method is extremely effective at manipulating the App Store and Play Store rankings, due to the fact that the ranking algorithms care most about download/install velocity, or the number of downloads/installs that an app receives in the most recent time period compared to other apps competing for the same keyword or category. 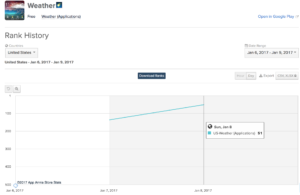 That is to say, if app A acquires 500 installs in the past one hour, it will likely earn the top rank, even if app B has acquired 1,000 installs in the past 7 days. In order to manipulate an app's category rank, the installs can be sourced from anywhere (i.e. from direct links, feature views or keyword searches), yet to manipulate keyword rankings, the installs must be acquired after a search for the target keyword or keyword variation. 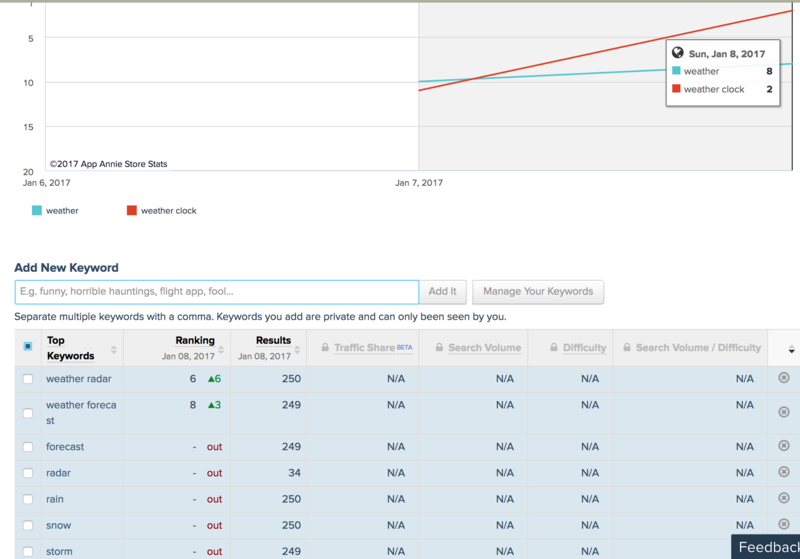 In the case of the Tool Box Studio/Fotoable spammer, we can all but confirm this fact by examining the ranking trends. 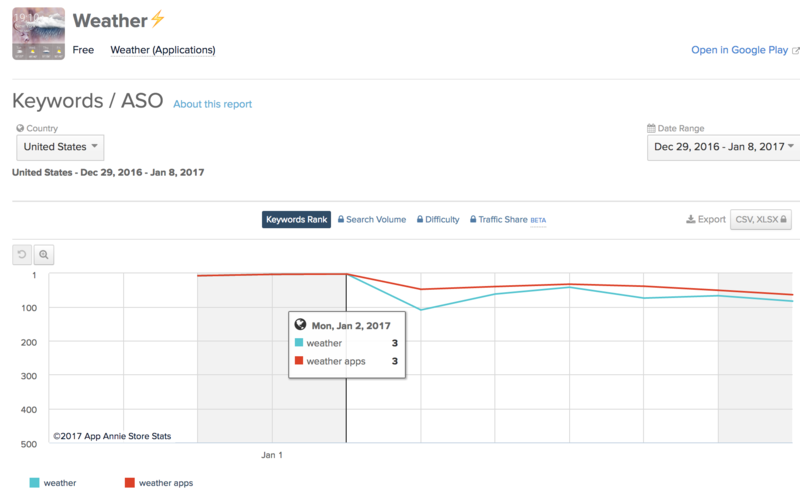 In the first screenshot from App Annie, we can see that Weather Fantasy was launched as a new app on January 6th, 2017 and within two days had climbed to #51 in the weather app category. A swift category ranking ascent is an indicator of spamming. 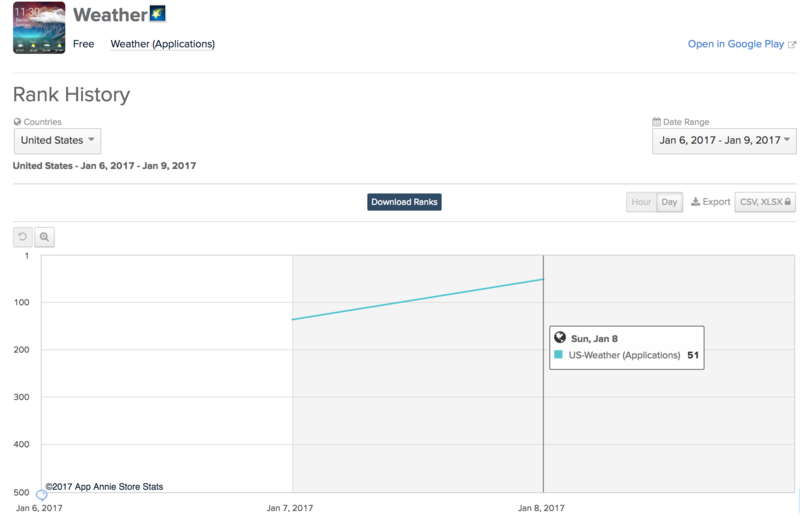 In Tool Box Studio/Fotoable's case, they spread the downloads/installs among most of their apps, so the ascent wasn't as pronounced as it could have been had they focused on one app; in many cases spammers use so many downloads/installs that they can acquire a #1 country rank within a single day. 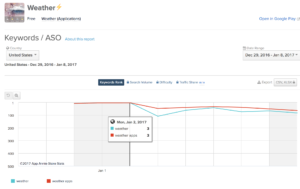 In this second screenshot, we can see that Weather Fantasy is likely using a keyword burst campaign strategy to acquire its top ranks for searches for weather. 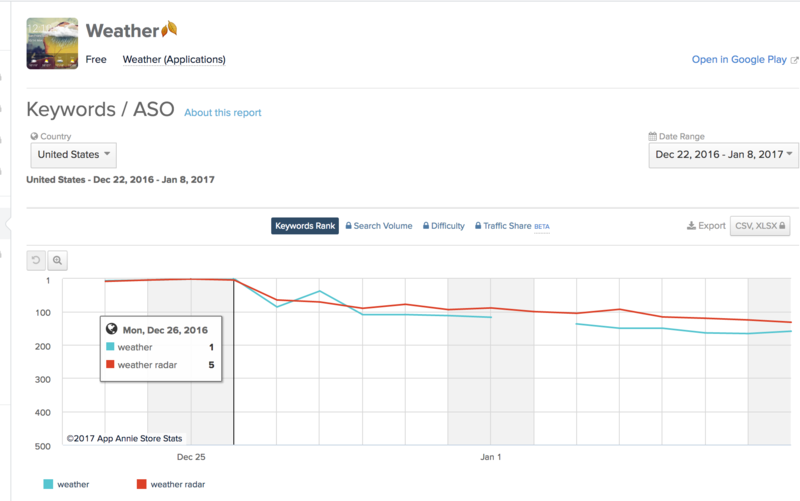 This can easily be discerned because a keyword burst campaign will improve not only an app's category rank as in the above chart, but they will also improve the app's rank for the targeted keyword (in this case "weather" related terms). The betraying flaw of a keyword burst campaign is that the many keywords that are not targeted will not see a commensurate rank improvement. We can see here in that Weather Fantasy does not even earn rank at all on other, relevant weather app keywords such as "forecast," "storm" and "radar." Keyword burst campaigns require fewer downloads than a category burst campaign to work, given that the install volume from each keyword is limited to search volume, and only enough installs are required to overcome the organic inertia of the other apps ranking for that keyword, which can usually be accomplished quite easily using inorganic methods (which inflate the overall pie of downloads available and disproportionally award them to the keyword bursting app). 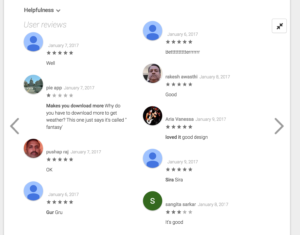 Another characteristic of spammy apps, such as those by Tool Box Studio/Fotoable is the presence of fake 5-star ratings, which give the app a set of ratings and a high star count and are crucial for completing the con of unwitting users looking for the most popular apps. Tool Box Studio/Fotoable also has a very high occurrence of the target keyword (weather) in its description; the word "weather" occurs 24 times out of the 176 words in the description (~14% of all keywords), likely boosting its keyword ranking algorithm relevance. In some cases keyword stuffing backfires, but in this case no issue was caused (possibly due to the effect of the keyword burst campaign, which keeps relevance high for the algorithmic vis-a-vis manipulating installation proportions for that keyword). Lastly, it's likely that the spammer's large portfolio is helping its cause, both from a keyword ranking algorithm perspective and via credibility with users (i.e. being a well-established developer). Anecdotal evidence supports the theory that the more apps earning high ranks in a developer account, the more each individual app benefits in relevance from a halo-type effect. For all the people who want to know what the weather is in lollipop candy land, this spammer is a welcome Play Store addition. For everyone else, it's yet another reminder that app store discovery is broken and needs fixing. 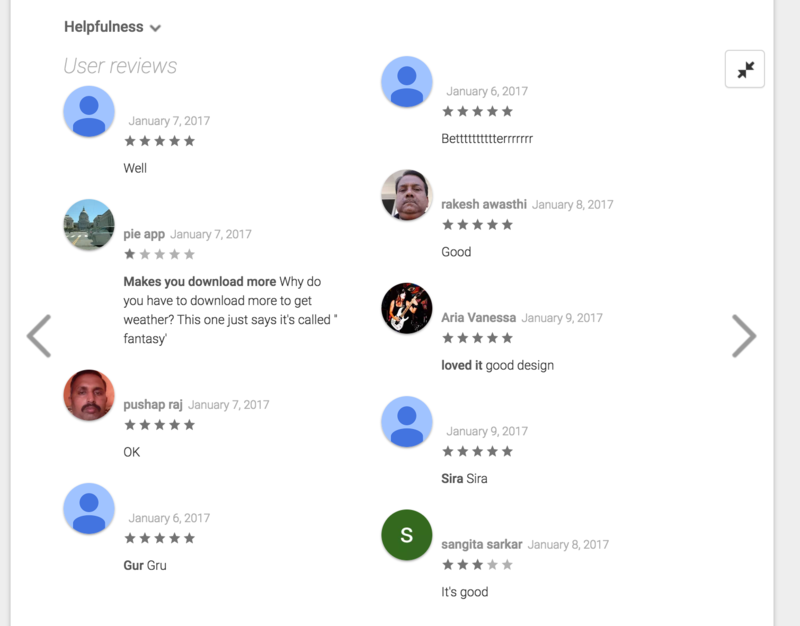 Google Play even has an app review policy that prevents ranking manipulation and keyword stuffing; it's ludicrous that all of these apps made it through Google's filter. Looking at the other apps in the Tool Box Studio/Fotoable developer account, it appears that this spammer's strategy was to churn multiple apps into top ranks, likely with the goal of blanketing keyword searches and capturing valuable top 10 rank real estate. The strategy seems to be failing, however, given the fact that a) it is expensive to maintain top ranks inorganically and b) each spam app likely saw low performance with organic (AKA real) users, causing each app's keyword ranks to quickly deteriorate without burst campaign support. Launch your app and immediately pay for installs at cents on the dollar, targeting installs from a search for the most popular keyword in your category. But beware: Google now scrutinizes apps for "active users," rather than downloads. It's a good thing you watched episode 28 of Silicon Valley, titled "The Uptick," and know that you can buy installs from a campaign vendor who promises that each user will leave your app installed for at least 30 days and will open the app periodically, to keep your active user numbers high. Phew! Throw emojis everywhere in your description and even your title for good measure, and bold everything. Don't forget to pay for some 5-star reviews to keep your legitimacy high (above a 4.0 star rating will usually do). For the finishing touch – make the font in your first screenshot cursive, because cursive font is so in, in the US of A.